An Enzyme Linked Immunosorbent Assay (ELISA) based on a monoclonal antibody, 3E1.2, was used to measure circulating Mammary Serum Antigen (MSA) in a study of 123 advanced breast cancer patients. Fifty two patients were monitored serially to investigate whether measurements of circulating MSA levels were of value in the management of advanced breast cancer patients on palliative therapy. Analysis of variance showed that circulating MSA levels at first presentation correlated with disease status both at initial presentation (p = 0.01) and also 4 months later (p = 0.003). At first presentation, the circulating MSA level also significantly correlated with the number of metastatic sites (p = 0.04), but this did not hold at 4 months. The circulating MSA levels did not at any time correlate with the type of treatment given nor age of the patient. 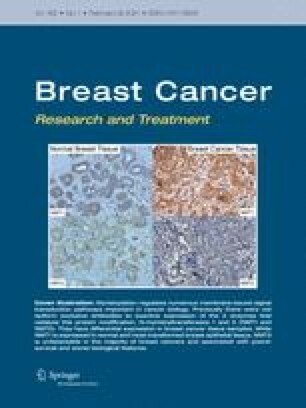 We conclude that MSA might ultimately be useful in the management of advanced breast cancer patients as a prognostic marker for the course of the disease and for monitoring patient response to palliative hormonal therapy and chemotherapy.